THE AFL trade dominoes are falling thick and fast, but on Wednesday road blocks halted several deals from going through. Trade period closes at 8.30pm AEDT next Wednesday but several clubs got down to business on day four as Dayne Beams dominated the headlines. Trade inclusion leaves Hawk "shattered"
Port Adelaide were reportedly "furious" with Chad Wingard over a mysterious Instagram post and now it looks like his time at the club has run its course. The forward and midfield utility has decided on his preferred landing destination in the trading period. Both Hawthorn and the Western Bulldogs were interested in the classy player, but he's nominated the Hawks as his club of choice. In reports, the initial deal from Hawthorn in exchange for Wingard was their first round pick (15) along with young defender Ryan Burton. The inclusion of Burton into trade talks caught everyone off guard, with none moreso than Burton himself. Currently enjoying his offseason break, the Hawks called 21-year-old on Thursday to notify him of their plans to include him in the deal. Being told the news took the shine off of his time away and left the versatile defender "shattered" according to the Herald Sun's Sam Edmund. Jesse Hogan's return home to Perth where he looks set to join Fremantle is on the brink of falling apart, as SEN's Sam McClure reports. The Demons are insistent on receiving two first round picks for the star forward, but the Dockers latest offer comes well below those demands. Their final offer to Melbourne was reportedly pick 11 along with a future second round pick. Hogan is contracted with the Demons next season and unless the Dockers relent on their stance, it looks likely he'll remain with Melbourne. Adelaide could be set to lose defender Jake Kelly after his reported interest in returning to Collingwood. The team his dad won a premiership with in 1990. 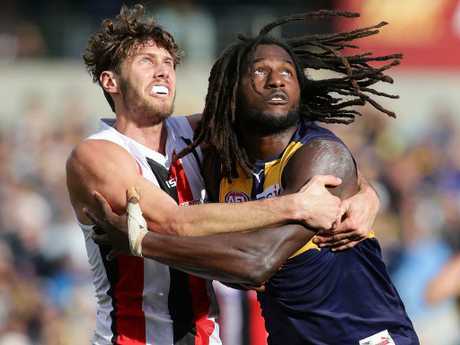 The move was first reported by 3AW's Shane McInnes, who floated a three-way trade involving Sydney and the Magpies' defender Tom Langdon. Don't panic St Kilda fans the deal isn't going to not occur, it's just being put on the backburner as the Swans chase the acquisition of Collingwood's Tom Langdon. If they're able to secure the defender who shone bright on grand final day, they'll then deal with the trade of Hannebery to St Kilda. "I think we're getting pretty close," Lethlean told reporters about a Hannebery trade. "I think there's a few different options available and both clubs have been talking pretty amicably. "It's only Thursday, it will get done today or not too far away if it's not." On a quieter day at the trade table, Melbourne and St Kilda have completed a trade that will send Melbourne midfielder Dean Kent across town to St Kilda. The Demons will receive draft pick number 65 in return for the midfielder. If Dayne Beams is planning to escape Brisbane he hasn't told the Lions. Brisbane coach Chris Fagan told SEN he was baffled by reports the midfielder star wants out. "He has not requested a trade," Fagan said. "There's been nothing come through to our club. We'll be surprised. When I got up this morning it was news to me. "I had a conversation with Dayne post-season during our normal exit interviews with our players, he was bright and bubbly about the future of our footy club and looking forward to continuing with us. "I've seen Dayne several times since, the most recent at the weekend in Horsham, spent time with him. "He has not mentioned that to me. That news is a complete surprise. As far as I'm concerned, there's nothing to discuss. "They (Brisbane's list management team) haven't rang me to say there's anything to the contrary to the situation as we understand it." Port Adelaide has landed pick six in the draft from Fremantle in a pick swap that is expected to help the Dockers start landing some of their targets. The Power also received a future third-rounder while handing over picks 11, 23, 30 and 49. The raid on Greater Western Sydney's midfield stocks might not be over. 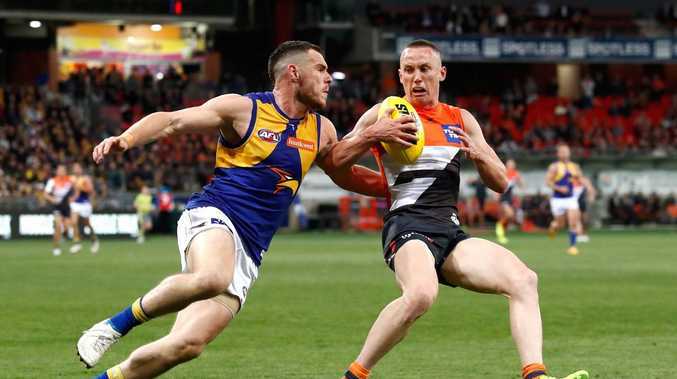 After Dylan Shiel nominated Essendon as his preferred destination, Hawthorn has been tipped to target Tom Scully. There have been no public comments from Scully's camp or the Giants about his future, but his name keeps being raised in the media and former St Kilda champion Leigh Montagna believes the Hawks could make a move. "It does feel if he does leave it would be to come back to Melbourne," Montagna said. "St Kilda would love for him to go there, he'd be a great fit with his leadership and his running ability. "Smells to me like a club like Hawthorn, they're someone who could land a Tom Scully ... keep a watch on Hawthorn." Adelaide forward Mitch McGovern, Port Adelaide's Jared Polec and Jasper Pittard, Swans speedster Gary Rohan, St Kilda ruckman Tom Hickey and North Melbourne's Ryan Clarke all found new homes on Wednesday. The trades had a knock-on effect, advancing negotiations on several fronts. The Swans, who featured in the three-club deal that sent McGovern to Carlton then essentially swapped Rohan for Clarke, are now in a better position to finalise a trade for Hannebery. Hannebery, who has three years to run on his current contract, is fully expected to become a Saint soon. "We would like to think it's close to being done," Swans football manager Tom Harley said on AFL Trade Radio. "The list managers sat down this afternoon. We would expect something to be done shortly." The Saints have also been freed-up to invest more time in Hannebery talks. GWS gun Dylan Shiel confirmed on Tuesday he'd chosen Essendon ahead of St Kilda and other suitors, while the Saints offloaded Hickey on Wednesday morning. The Eagles, desperate to beef-up their ruck depth given Scott Lycett's departure and Nic Naitanui's knee injury, swapped pick No. 39 and a future fourth-round pick in exchange for Hickey, pick No. 60 and a future fourth-round selection. "It's exciting to not be frightened of the flight over to Perth to face Nic Nat," Hickey joked. "It almost seems a bit too good to be true, to be able to come and play for the reigning premiers." Melbourne's Dom Tyson is expected to join North soon but the Demons have locked away midfielder Aaron vandenBerg, who considered a shift to Sydney before signing a contract extension that runs until the end of the 2021 season. A deal between Essendon and the Giants regarding Shiel, who has a year to run on his current contract, will require plenty of brokering. Port had little interest in posturing regarding Polec. They parted with the midfielder, Pittard and pick No. 48 in exchange for North Melbourne's pick No. 11 and a future fourth-round selection. The Blues acquired McGovern and a future third-round pick from the Crows. Adelaide's compensation for losing McGovern was the Swans' first-round pick (No. 13), a future fifth-round selection from Carlton plus SANFL talent Shane McAdam (one of the Blues' pre-draft access picks). Sydney received picks No. 26 and No. 28 from the Blues, and No. 40 from the Crows. Brisbane traded picks No. 24, No. 58 and No. 79 to Gold Coast in exchange for selections No. 32, No. 41, No. 44 and No. 77. The Lions are ramping up their pursuit of Fremantle's reigning best and fairest Lachie Neale. The league has awarded the Magpies a third-round draft pick (currently No. 57) as compensation for losing Fasolo.